Work seamlessly from multiple locations by using any device. The traditional workplace is undergoing radical changes. The convergence of cloud services and communication technologies have created a revolution in the way people work. Workers are no longer reliant on being tethered to the office to accomplish tasks. The traditional workplace is undergoing radical changes. The convergence of cloud services and communication technologies have created a revolution in the way people work. Workers are no longer reliant on being tethered to the office to accomplish tasks. Having reliable, easy-to-use and secure remote working technologies is the key to enabling a successful remote working strategy. Mobile email solutions allow your team to stay hooked into the company email system, whenever they want and wherever they are. With improved communications, your team can be productive at all times – and they’ll never miss another important message again. Having access to key files, whenever and wherever, ensures that your team can be productive while out in the field. Your business will also be able to offer remote working facilities in the event of a local disaster – like snow. The modern workforce is often spread across the country – or even the world. Cloud-based collaboration systems, like Microsoft Office 365 or Google Apps, allow your team to work together, even when they are not physically nearby. This allows your team work from anywhere, such as at home, at a customer site or at a coffee shop. Potential downtime can be turned into productive time. Your team can collaborate more easily with email, calendar, remote file sharing and VPN solutions by RealClear. With remote working technologies, your team no longer has to wait for a team member to “get back to the office” in order for a decision to be made. File sharing, screen sharing and a host of other collaboration technologies have negated the need for your team to be office-bound. Numerous studies have shown that employees who work remotely are happier and more productive. This is now recognised by companies, such as Dell, Xerox, IBM, Accenture and PWC, who all embrace remote working practices. JetBlue, the US-based budget airline, employs almost 2000 remote employees and continues to trounce their competitors in customer satisfaction surveys. A VPN or “Virtual Private network” allows you to set-up a secure remote access link over the internet between your office and remote locations. This enables you and your team to securely login to the office network from any location, such as an airport departure lounges, hotel or coffee shop. Our VPN solutions are easy-to-use and compatible with iOS (iPhone and iPad), OS X (Apple), Android and Windows. 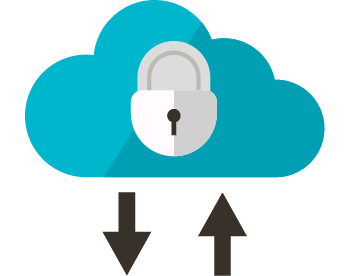 We offer SSL-VPN and IP-SEC VPN solutions that are robust, secure and user-friendly. These security protocols can be enhanced by using two-factor authentication.